The industry is still in the process of refining the various wearable gadgetry it has on offer. Hopefully, looks are on top of their list. But if you thought that the techies that run such companies are out of their element when talking fashionable design, you might have to reconsider, for even clothing company Tommy Hilfiger doesn't fare much better when designing for the tech junkies out there. 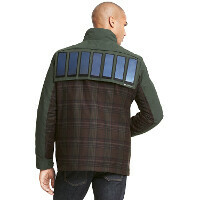 Say hello to the limited edition (men's and women's) Solar Powered Jacket – a jacket with a number of medium-sized, water-proof solar panels on its back. Those are used to charge the battery in the jacket's front pocket, which is connected to them through a cable that runs "discreetly" along the linings of the jacket. The battery itself offers two USB ports, so you can charge up to two devices simultaneously. According to Pvilion, which designed the solar panels, when fully charged, the pack can juice up "a standard 1500mAh device" up to four times. Now, we won't pretend to be fashion experts or anything, and we do get that the jacket is intended for the outdoorsy type, but we'd be lying if we said that we found the design agreeable. Especially since we'd have to whip out $599 for one of those. At least half of the proceed go towards The Fresh Air Fund, so that's some comfort. By all means, do chime in. I haven't found anything Tommy Hilfiger put out in the past few years to be very agreeable looking so no surprise about their tech clothing. okay, that looks like a piece of s**t.
the girl is cute.. that's a shame she has to wear those crappy clothes..
Have fun wearing this in the summer time outdoors when the temperature is 25C (77F) or higher.